Rinse turkey breast and pat dry with paper towels; sprinkle with salt and black pepper. Place 2 rosemary sprigs, 2 thyme sprigs, 1/4 cup chopped onion, and butter slices into turkey breast cavity. Place celery leaves, remaining white onion, and remaining rosemary and thyme sprigs into a large slow cooker. Lay turkey breast over vegetables and herbs with the top facing down. Pour white wine into cooker and cover. Cook on High until meat is tender and an instant-read meat thermometer inserted into the thickest part of the breast meat reads 170 degrees (75 degrees C), about 6 hours. 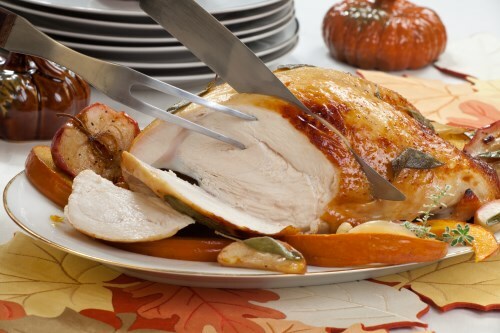 Let turkey breast rest for 15 minutes before slicing.